Excellent copy of "Pescatori di Telline" by Francesco Lojacono by Italian artist Nicholas Butler Oil on canvas (hand prepared canvas, final ageing treatment). Measures: 30 x 70 cm. canvas 46 x 86 cm framed. Nicholas Butler was born in 1966 in Florence, where he attended the Institute of Art obtaining a Master of Arts diploma in graphic design, after which he attended the Academy of Fine Arts of Florence obtaining a Diploma of Painting. 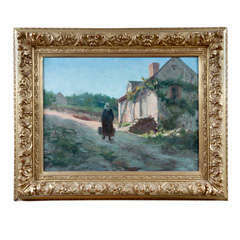 Following this he has developed an interest for the study of the styles and painting techniques used over the centuries acquiring the ability to reproduce works of art of the various periods, faithfully following the characteristics peculiar to each period and master. 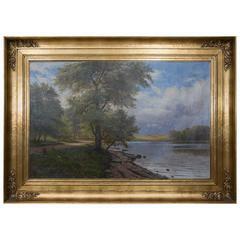 His production of original works of art consists chiefly of landscapes and views of a certain nineteenth century taste, a period particularly adored by the artist, and of portraits for which he receives frequent commissions. 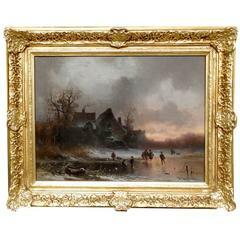 Nicholas Butler's paintings are included in many private collections throughout Italy and abroad. Acrylic on canvas paintin Signed. Very good condition. 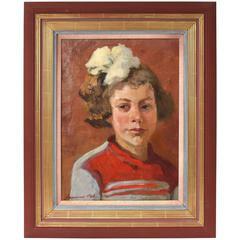 Portrait of a girl with dark hair, undated [circa 1964], oil on board, unsigned. Purchased from family by descent Well framed. Oil on canvas painting of rocks at Land's End in Cornwall by Charles Ernest Butler (1864–1933), England, circa 1900. Nicholas Berger Fine Oil on Panel, "Island Roses"